You and your family will be entertained and educated at the Concrete Heritage Museum, which includes the stories, artifacts and everyday items from bygone years. Learn about the town’s rich history of cement plants, loggers, miners and characters! JOIN US! The Museum Association is made up of a small group of individuals dedicated to the restoration of the museum building located in the town of Concrete – a restoration project which has been ongoing and has garnered $30,000.00 in donations and fundraising to purchase. 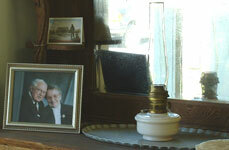 Its collections were donated by Herb Larsen (a local pioneer and logger) and family. The building was previously called Camp Seven Museum, named after the numbered railroad logging camps of the English Logging Company. Members of the Museum Association welcome volunteers to help with any aspect of the Concrete Heritage Museum project. Meetings are held the third Wednesday of each month, at 7 p.m. at the Concrete Museum at 7380 Thompson Ave, Concrete. The Museum’s website provides digital archives of the Concrete Herald dating from the 1900’s to 2017.